Illume’s Signature Soy line is exclusively found at Target stores across the country and I must say, I have been burning and reviewing a lot of this brand lately. The best part… these candles are very affordable, even if you’re on the tightest budget. For instance, this medium candle was only $10.00 and a lot of times they’re on sale for less than that. That’s pretty decent for a candle that does give a great scent throw and burns a long time. 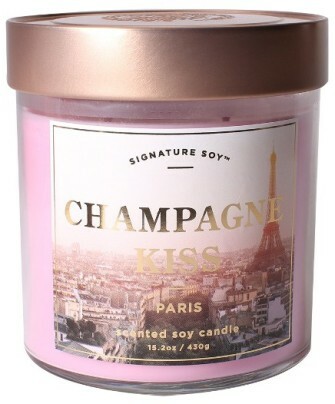 Champagne Kiss was such a pretty candle with it’s rose pink wax and label showing a muted picture of Paris and the Eiffel Tower. Tells you where this fragrance derives from. Ooh la la!! Smelling the wax, I smelled a little more than those three elements. I did smell the citrus loud and clear but also an effervescence that tickled my nose a bit. Was that the champagne? Oh, I hope so!! Also hoping the melon notes come to life once the candle is burning. I lit this candle in a small room to start out and that’s where it stayed till the very end. One the wicks were lit, I let it burn for a good two hours before coming back to check on it, and when I did – all I could smell was bubblegum! Sugary and sweet bubblegum, and I loved every second of it. I kept going back over and over again to make sure I was right and with my nose up to the candle, I could definitely pick out melon the most but once I moved away, the room went straight back to bubblegum. What a fun scent this was and one I thoroughly enjoyed! Strength – I would rate Champagne Kiss a 10 out of 10 in a really small room. 6/7 in a medium size room. Not bad all in all. This candle burned great. No wick issues. Clean burning from beginning to end. Very little wick maintenance too which is my favorite kind of candle. I loved Champagne Kiss from Illume (purchased at Target) and will definitely pick up a few more to keep on hand. This was a fun and fresh bubblegum and boy was this candle pretty to watch burn with it’s bright pink wax. Check this candle out next time you’re at your local Target. It’s a keeper. And just an FYI, I do notice it’s not available to order on their website but it is in stores. I was just there and saw it.